1. W.Y. Ko, L.J. Chen, S.T. Lin, and Y.P. Chen, “Measurements for the Dissociation Conditions of Methane Hydrate in the Presence of 1,3,5-Trioxane and Oxolan-2-ylmethanol”, J. Chem. Eng. Data, 56 (8): 3406-3410, 2011. 2. Y.-C. Huang, J.-H. Hsu, Y.-C. Liao, W.-C. Yen, S.-S. Li, S.-T. Lin, C.-W. Chen, and W.-F. Su, “Employing an amphiphilic interfacial modifier to enhance the performance of a poly(3-hexyl thiophene)/TiO2 hybrid solar cell”, J. Mater. Chem., 21 4450- 4456, 2011. 3. S.-N. Huang, T.A. Pascal, W.A. Goddard, P.K. Maiti, and S.-T. Lin, “Absolute Entropy and Energy of Carbon Dioxide Using the Two-Phase Thermodynamic Model”, J. Chem. Theory Comput., 7 (6): 1893–1901, 2011. 4. M.T. Hsieh and S.T. Lin, “A Predictive Model for the Excess Gibbs Free Energy of Fully Dissociated Electrolyte Solutions”, AIChE J., 57 (4): 1061-1074, 2011. 5. C.M. Hsieh, S. Wang, S.T. Lin, and S.I. Sandler, “A Predictive Model for the Solubility and Octanol-Water Partition Coefficient of Pharmaceuticals”, J. Chem. Eng. Data, 56 (4): 936-945, 2011. 6. C.M. Hsieh and S.T. Lin, “First-Principles Prediction of Vapor-Liquid-Liquid Equilibrium from the PR plus COSMOSAC Equation of State”, Ind. Eng. Chem. Res., 50 (3): 1496-1503, 2011. 7. Y.T. Tung, L.J. Chen, Y.P. Chen, and S.T. Lin, “The Growth of Structure I Methane Hydrate from Molecular Dynamics Simulations”, J. Phys. Chem. B, 114 (33): 10804-10813, 2010. 8. S.T. Lin, P.K. Maiti, and W.A. Goddard, “Two-Phase Thermodynamic Model for Efficient and Accurate Absolute Entropy of Water from Molecular Dynamics Simulations”, J. Phys. Chem. B, 114 (24): 8191-8198, 2010. 9. P.C. Kuo, L.J. Chen, S.T. Lin, and Y.P. Chen, “Measurements for the Dissociation Conditions of Methane Hydrate in the Presence of 2-Methyl-2-propanol”, J. Chem. Eng. Data, 55 (11): 5036-5039, 2010. 10. C.M. Hsieh, S.I. Sandler, and S.T. Lin, “Improvements of COSMO-SAC for vapor-liquid and liquid-liquid equilibrium predictions”, Fluid Phase Equilib., 297 (1): 90-97, 2010. 11. C.M. Hsieh and S.T. Lin, “Prediction of liquid-liquid equilibrium from the Peng-Robinson plus COSMOSAC equation of state”, Chem. Eng. Sci., 65 (6): 1955-1963, 2010. 12. A. Debnath, B. Mukherjee, K.G. Ayappa, P.K. Maiti, and S.T. Lin, “Entropy and dynamics of water in hydration layers of a bilayer”, J. Chem. Phys., 133 (17): 174704, 2010. 13. W.-C. Yen, B. Pal, J.-S. Yang, Y.-C. Hung, S.-T. Lin, C.-Y. Chao, and W.-F. Su, “Synthesis and Characterization of Low Bandgap Copolymers Based on Indenofluorene and Thiophene Derivative”, J. Polym. Sci., Part A: Polym. Chem., 47 (19): 5044 - 5056, 2009. 14. S. Wang, S.T. Lin, S. Watanasiri, and C.C. Chen, “Use of GAMESS/COSMO program in support of COSMO-SAC model applications in phase equilibrium prediction calculations”, Fluid Phase Equilib., 276 (1): 37-45, 2009. 15. S.-T. Lin, M.-K. Hsieh, C.-M. Hsieh, C.-C. Hsu, and S.-N. Huang, “Reply to " Comment on "Towards the development of theoretically correct liquid activity coefficient models""“, J. Chem. Therm., 41 (11): 1314-1316, 2009. 16. S.T. Lin, M.K. Hsieh, C.M. Hsieh, and C.C. 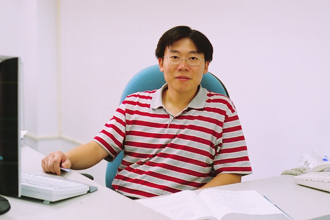 Hsu, “Towards the development of theoretically correct liquid activity coefficient models”, J. Chem. Therm., 41 (10): 1145-1153, 2009. 17. Y.C. Hung, J.C. Jiang, C.Y. Chao, W.F. Su, and S.T. Lin, “Theoretical Study on the Correlation between Band Gap, Bandwidth, and Oscillator Strength in Fluorene-Based Donor-Acceptor Conjugated Copolymers”, J. Phys. Chem. B, 113 (24): 8268-8277, 2009. 18. M.K. Hsieh and S.T. Lin, “Early structural development in melt-quenched polymer PTT from atomistic molecular dynamic simulations”, J. Phys.-Condes. Matter, 21 (50): 505101, 2009. 19. C.M. Hsieh and S.T. Lin, “Prediction of 1-octanol-water partition coefficient and infinite dilution activity coefficient in water from the PR + COSMOSAC model”, Fluid Phase Equilib., 285 (1-2): 8-14, 2009. 20. C.M. Hsieh and S.T. Lin, “First-Principles Predictions of Vapor-Liquid Equilibria for Pure and Mixture Fluids from the Combined Use of Cubic Equations of State and Solvation Calculations”, Ind. Eng. Chem. Res., 48 (6): 3197-3205, 2009.